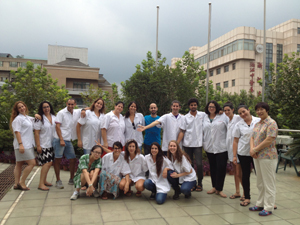 On Sep 4th 2014, a group of 17 Israeli students had successfully completed 4 weeks clinical training in our hospital. Our hospital has been collaborating with Reidman College of Complementary Medicine in Israel since 1999. Over the past 15 years, we have accepted at least 450 students from the college for clinical intensive training. Many of them now become popular professional Chinese Medicine doctors, and have treated thousands of chronic diseases, helped lots of local people. The group in 2014 has 17 participants with 4 weeks training. The subjects range from Acupuncture, Tuina, Pediatric Tuina, TCM Internal Medicine, TCM Gynecology, TCM Pediatric, TCM Neurology, TCM Endocrine, TCM Cardiology etc. After the one month intensive training, students said , they saw many different cases, have gained double, or even triple more knowledge than spending the same time in their domestic, and also understand better the difference between theoretical TCM and clinical TCM. They not only accumulate clinical experience but also built up stronger confidence in TCM. In the meantime, some students who have chronic problems have tried Chinese Medicine personally. They have received original TCM treatment by our distinguished veteran doctors in our hospital. One of student, she was suffering unbearable pain on her arm after mammary cancer surgery since three year ago. She cannot live without strong pain killer, especially in the night could hardly fall in asleep. Our doctors have treated her by both acupuncture and herbs. After a few days, her pain is alleviated, sleep is also better, and her western medicine works better. Some other students who have losing hairs, chronic diarrhea and skin diseases, also get treatment by our doctors, and the feedbacks were good. Since Our hospital and the apartment hotel is just 5 minutes walk to the world-renowned beautiful west lake; it became students' part time paradise. In the early morning, they can practice Taiji and do jogging on the lake side, then come to hospital for training. In the later afternoon, they cycle around the lake and the city. On the weekends, they also traveled different cities; it is another experience and gain knowledge of China and Chinese culture. They said it was a wonderful experience in their life, after they back to Israel they will encourage more schoolmates and fellow friends to our hospital, to Hangzhou.